Callisto is a moon of the planet Jupiter, discovered in 1610 by Galileo Galilei. It is the second largest moon orbiting Jupiter, after Ganymede, and the third largest moon in the Solar System. Callisto is almost the same size as the planet Mercury, being 99% the diameter of the planet, but is much less massive. 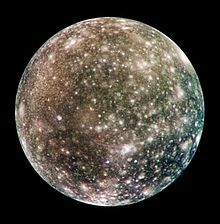 Of the four Galilean moons of Jupiter, Callisto is the farthest out, with an orbital radius of about 1,880,000 kilometres. It does not form part of the orbital resonance that affects three inner Galilean satellites, Io, Europa and Ganymede. Like the Earth's Moon, Callisto rotates synchronously with its orbital period. This means that one side is always turned toward Jupiter, while the other side never sees the face of the planet. Callisto's surface is less affected by Jupiter's magnetosphere than the seven moons nearer the planet. Callisto has about equal amounts of rock and ices, with an average density of about 1.83 g/cm³. Chemical compounds on the surface include water ice, carbon dioxide, silicates, and organics. The Galileo spacecraft made investigations of the moon, and revealed that Callisto may have a small silicate core and possibly a subsurface ocean of liquid water more than 100 kilometers deep. The surface of Callisto is heavily cratered and extremely old. The surface does not show any sign of processes occurring below the surface such as plate tectonics, earthquakes or volcanoes, and is thought to have evolved mainly under the influence of meteorite impacts. Notable surface features include multi-ring structures, impact craters in different shapes, and chains of craters (known as catenae) and associated scarps, ridges and deposits. On a smaller scale, the surface is varied. It is made up of frost on hill tops, surrounded by a smooth blanket of dark material in valleys. This is thought to result from the degradation of small landforms, caused by sublimation. This is supported by the few small impact craters, and the presence of numerous small knobs which are thought to be their remains. The absolute ages of the landforms are not known. Callisto is surrounded by an extremely thin atmosphere made out of carbon dioxide and probably oxygen molecules. There is also a rather intense ionosphere. An ocean is thought to exist within Callisto. This may mean that life might exist. However, this is less likely than on nearby Europa. Various space probes from Pioneers 10–11 to Galileo and Cassini−Huygens have studied the moon. Callisto is considered the most suitable place for humans to settle for future exploration of the Jovian system. ↑ 3.0 3.1 3.2 3.3 3.4 "Planetary Satellite Mean Orbital Parameters". Jet Propulsion laboratary, California Institute of Technology. ↑ 4.0 4.1 4.2 4.3 4.4 Anderson, J.D. ; Jacobson R.A, McElrath T.P. et al (2001). "Shape, mean radius, gravity field and interior structure of Callisto". Icarus 153: 157–161. doi:10.1006/icar.2001.6664. http://adsabs.harvard.edu/abs/2001Icar..153..157A. ↑ "Classic Satellites of the Solar System". Observatorio ARVAL. Retrieved 2007-07-13. ↑ 7.0 7.1 Carlson, R.W. ; et al.t (1999). "A tenuous carbon dioxide atmosphere on Jupiter's moon Callisto". Science 283: 820–821. doi:10.1126/science.283.5403.820. http://trs-new.jpl.nasa.gov/dspace/bitstream/2014/16785/1/99-0186.pdf. ↑ Liang, M.C. ; Lane B.F., Pappalardo R.T. et al. (2005). "Atmosphere of Callisto". Journal of Geophysics Research 110: E02003. doi:10.1029/2004JE002322. http://yly-mac.gps.caltech.edu/ReprintsYLY/N164Liang_Callisto%2005/Liang_callisto_05.pdf. ↑ Cox, Brian; Cohen, Andrew (2010). Wonders of the Solar System. HarperCollins. p. 231. ISBN 9780007386901. ↑ Musotto, Susanna (2002). Varadi, Ferenc; Moore, William; Schubert, Gerald. "Numerical Simulations of the Orbits of the Galilean Satellites". Icarus 159: 500–504. doi:10.1006/icar.2002.6939. http://adsabs.harvard.edu/abs/2002Icar..159..500M. ↑ Cooper, John F. (2001). Johnson, Robert E.; Mauk, Barry H.; et al.. "Energetic ion and electron irradiation of the icy Galilean satellites". Icarus 139: 133–159. doi:10.1006/icar.2000.6498. http://icymoons.com/europaclass/Cooper_gllsat_irrad.pdf. ↑ Kuskov, O.L. ; Kronrod, V.A. (2005). "Internal structure of Europa and Callisto". Icarus 177: 550-369. doi:10.1016/j.icarus.2005.04.014. http://adsabs.harvard.edu/abs/2005Icar..177..550K. ↑ Showman, Adam P.; Malhotra, Renu (1999). "The Galilean Satellites". Science 286. doi:10.1126/science.286.5437.77. http://www.lpl.arizona.edu/~showman/publications/showman-malhotra-1999.pdf. ↑ 14.0 14.1 Greeley, R. (2000). Klemaszewski J.E. ; Wagne, L. et al.. "Galileo views of the geology of Callisto". Planetary and Space Science 48: 829–853. http://adsabs.harvard.edu/abs/2000P%26SS...48..829G. ↑ Moore, Jeffrey M. (1999). Asphaug, Erik; Morrison, David; et al.. "Mass movement and landform degradation on the icy Galilean satellites: results of the Galileo Nominal Mission". Icarus 140: 294–312. doi:10.1006/icar.1999.6132. http://adsabs.harvard.edu/abs/1999Icar..140..294M. ↑ Kliore, A.J. (2002). Anabtawi, A; Herrera, R. G.; et al.. "Ionosphere of Callisto from Galileo radio occultation observations". Journal of Geophysics Research 107: 1407. doi:10.1029/2002JA009365. http://adsabs.harvard.edu/abs/2002JGRA.107kSIA19K. ↑ Lipps, Jere H. (2004). Delory, Gregory; Pitman, Joe; et al.. "Astrobiology of Jupiter’s Icy Moons". Proc. SPIE 5555: 10. doi:10.1117/12.560356. http://learning.berkeley.edu/astrobiology/2004ppt/jupiter.pdf. ↑ Trautman, Pat; Bethke, Kristen (2003). "Revolutionary concepts for human outer planet exploration (HOPE)" (PDF). NASA. This page was last changed on 14 January 2019, at 13:43.